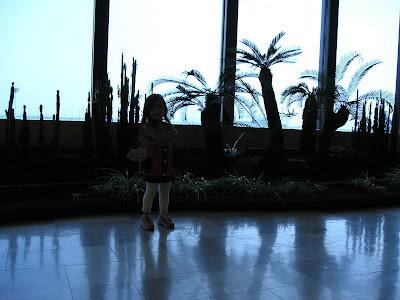 My wife took this photo of my daughter at Busan airport when we we're going to our island hopping in Jeju Korea last May. Can you see my daughter standing there? Have a good start of the month everyone! Thanks to all the ones who have casted their votes on the smile contest. She won! A proud papa for sure, but she couldn't lose with that face...congrats family!!! it's a bit dak but yes I can see Rylie, nice photo effect with dark inside and sky outside. It's as though she is as one amongst the plants in the background! Nice play on repeats and verticality! Beautiful shot! not as beautiful as those kids though!!!Congratulations!! What an adorable little miss - how could she not win? That is a lovely photo of your daughters silhouette and a nice shadow shot too. Lovely picture of your daughter at the airport. Congrats on her win! I very lovely photo. Great shadow shot! Lots of interesting shadows in this one. Beautiful picture. You could have posted it for Jame's Weekend Reflections, too. Oh Im so happy! Congrats! !